Shares of the Marlboro maker got dumped last year as a number of threats arose. 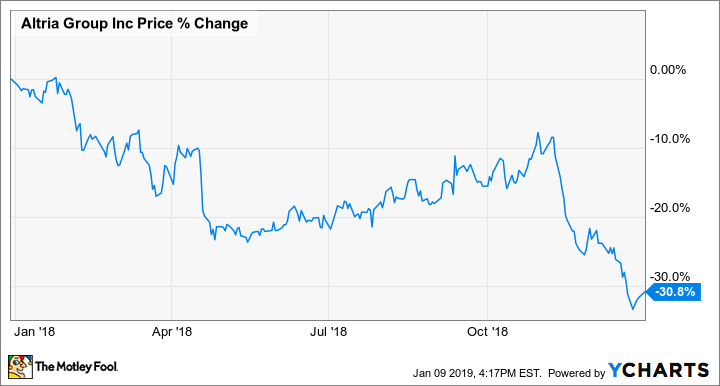 Shares of Altria (NYSE:MO) got smoked in 2018 during what proved to be a transformational year for the Marlboro-maker. According to data from S&P Global Market Intelligence, the stock finished the year down 31% as tobacco stocks widely struggled with perceived problems about their ability to transition away from cigarettes. Altria also made two surprising investments at the end of the year, taking stakes in marijuana-grower Cronos Group and JUUL, the popular maker of flavored e-cigarettes. As you can see from the chart below, Altria's losses came largely from two noticeable swings -- one in April, when Philip Morris (NYSE:PM) reported disappointing growth from its IQOS product in Japan, and then later in November on a pair of warnings from the Food & Drug Administration. Altria's worst slide of the year came in April, when the stock fell 14% over a one-week span as it suffered multiple analyst downgrades and then saw peer Philip Morris hammered on its own bad news. On April 18, the stock lost 4% on a pair of downgrades as Citi analyst Adam Spielman said the cigarette industry was being disrupted by JUUL, underscoring Altria's challenges with declining cigarette volume sales in the U.S. The following day, the domestic tobacco-maker's stock tumbled again, losing 6%, after Philip Morris said in its earnings report that its heat-not-burn IQOS product was seeing sales plateau in Japan, a key market for the international tobacco company. That spelled bad news for the tobacco sector as a whole as it cast it doubt on its ability to pivot to next-generation products, and it was also seen as a negative for Altria since the company has partnered with Philip Morris to sell IQOS in the U.S. once the FDA approves it. After Altria stock steadily regained those losses, it plunged again in November as the FDA signaled it would crack down on menthol cigarettes as part of a broader ban on flavored cigarettes and e-cigarettes, a problem for the cigarette industry in general, though Altria has limited exposure to that segment. Altria closed out the year by taking a 45% stake in Cronos Group, the Canadian marijuana grower, for $1.8 billion, and investing $12.8 billion for a 35% stake in JUUL, though investors were unimpressed with either move as the stock continued to slide through December. The company is at a crossroads as it can only prop up cigarette profits for so long and must eventually transition to new products. Therefore, the investments in JUUL and Cronos seem like the right moves, though whether or not Altria overpaid for them is a fair question. For investors, the stock looks cheap after last year's collapse. Shares trade at a P/E of 12.6, and the stock pays a sizable dividend yield of 6.6%. Check out the latest Altria earnings call transcript.